The New Yorker Hotel was built by Garment Center developer Mack Kanner. 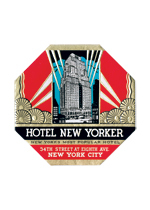 The New Yorker Hotel was built by Garment Center developer Mack Kanner. When the project was announced in 1928, the Sugarman and Berger designed building was planned to be 38 stories, at an estimated cost of $8 million. However, when it was completed in 1929, the building had grown to 43 stories, at a final cost of $22.5 million and contained 2,500 rooms, making it the city's largest for many years. Hotel management pioneer, Ralph Hitz, was selected as its first manager, eventually becoming president of the National Hotel Management Company. An early ad for the building boasted that the hotel's bell boys were 'as snappy-looking as West Pointers' and that it had a radio in every room with a choice of four stations.